Overall India mobile phone shipment crossed 300 Million units for the first time ever with smartphones capturing almost 44% of the total volumes in CY 2017.However, Samsung was the market leader in both the segments on annual basis. According to the latest research from Counterpoint’s Market Monitor service, India’s overall mobile phone shipments grew 37% and smartphone shipments grew 12% with feature phones growing an astonishing 55% during 4Q 2017. Despite India’s seasonal peak normally being pre-Diwali shipments in the third quarter, the market set a volume shipment record in the fourth quarter for the first time. India mobile handset and smartphone market grew by 37% and 12% YoY driven by strong demand from the featurephone and smartphone segment. However, local brands like Micromax and Lava have done well in CY 2017 recovering from their all-time low during demonetization last year. Micromax Bharat and Lava Z series performed well in the sub $100 segment. Micromax Bharat 2 was the best-selling smartphone in the sub $75 segment during CY 2017. Xiaomi (259%), iTel (213%), Huawei (165%), Vivo (115%) and OPPO (104%) were the fastest growing smartphone brands during CY 2017. Affordable mid end segment (₹10,000-₹15,000 or US$150-$230) was the fastest growing segment (+52%) in CY 2017 driven by the strong performance of Xiaomi. The Chinese vendor alone, contributed to almost 37% of the shipments in this segment. Average selling price of the overall smartphone market grew 13% YoY due to increased mix of mid segment phones. 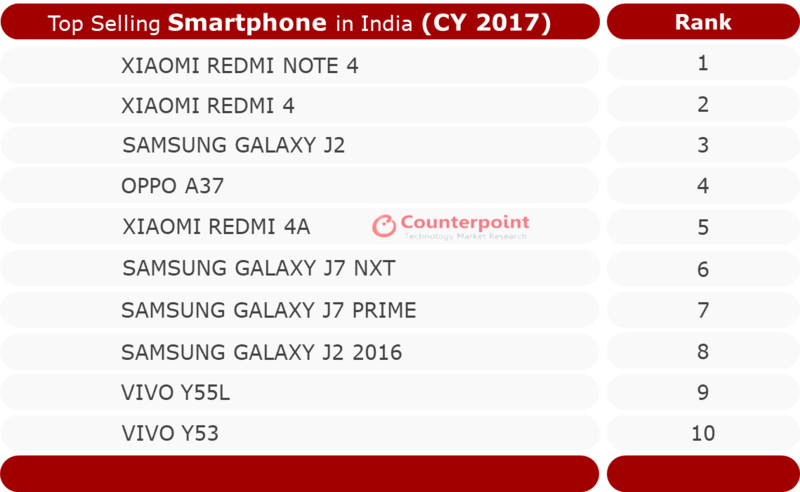 Over ten new smartphone brands entered India during CY 2017. Players like Nokia HMD, Comio, Infinix and Tecno did well in their first year of operations in India, by expanding their distribution reach in a short span of time. Premium segment (>₹30,000, US$465) grew 20% YoY during CY 2017 due to the strong performance of OnePlus, Apple & Samsung. OnePlus was the fastest growing brand in the premium segment during CY 2017. Qualcomm was the leader amongst smartphone chipset suppliers. Qualcomm powered smartphones grew a healthy 53% YoY in CY 2017. The demand of its chipsets in the fastest growing (₹10,000-₹15,000) segment drove growth. Online sales and promotions remained strong even after Diwali till the end of December 2017 as some of the brands were clearing their inventory. However, new launches by brands like OnePlus, Nokia HMD, Huawei, Micromax, Xiaomi drove shipments. Over 60 new smartphone models were launched after Diwali alone. CY 2017 saw intense competition in the smartphone segment with over 100 brands competing in the space. The comprehensive and in-depth Q4 2017 Market Monitor is available for subscribing clients. Please feel free to contact us at [email protected] for further questions regarding our in-depth latest research, insights or press enquiries.